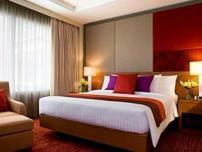 Getting around Bangkok is going to be foremost on your mind and planning ahead will make this as easy as possible. If you want learn about going around Bangkok, then read these useful tips before you set off on your journey. 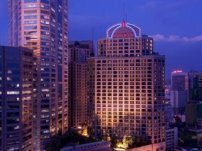 Bangkok is a large sprawling city with no distinct centre, if you have never been before, then here are some useful tips to navigate your way around. So what is the MRT? Well, it stands for Mass Rapid Transport and you should think of it as the Underground. This train can take you very quickly across the city of Bangkok for 16 - 40 baht and the train goes from Hua Lamphong all the way to Chatuchak Market and more. The current MRT fare tables can be found here. There is more information on the BTS and MRT here as you are sure to want to use it during your stay in Bangkok. So what is the BTS and what does BTS stand for? 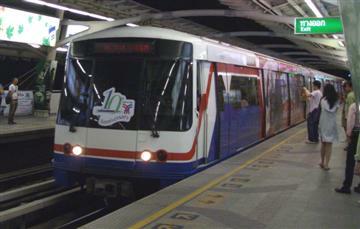 These three letters are the acronym for Bangkok Transport System and the BTS is more commonly known as the "Skytrain". The Bangkok Skytrain has about 46 km of track and is by the far the best way to go around Bangkok, costing only 15 - 55 baht per trip. Most of the large shopping malls and popular shopping districts are well served by the BTS, so if you can, try to get a hotel within walking distance of one of the BTS stations. You will find it so much more convenient to travel about the city. Now, as great as the MRT and BTS are, these two transport systems do not cover every part of Bangkok. A couple of the of the main areas that tourists come to visit are the Grand Palace and Chinatown areas and these are not serviced by the MRT or BTS trains. Well here are some more options. For all those places that you can't get to on the MRT or BTS there is the humble old taxi. Bangkok is well served by taxis and they come in all sorts of colours. As a broad generalisation, Green and Yellow taxis are privately owned and Pink, Blue, Yellow and all the other colours are company owned. Most taxis around the city are the Toyota Corolla model. They are big enough to fit four people, easy to manoeuvre in the small streets and cheap to run. Taxis are supposed to take you wherever you wish and they are not allowed to refuse a fare. However in the real world things don't operate according to the rule of Law and there are certain places that are difficult to reach or get gridlocked with traffic. So you can understand the Taxi driver's reluctance to take a fare that he will lose money on, so first you need to open the rear door and tell the driver where you wish to go. He will either accept or say no. If he doesn't want the fare or starts to bargain a fixed priced, just close the door and get another taxi. There are plenty of taxis in Bangkok. Taxis have a flag fall of 35 Baht and then a certain price per kilometre after that. If you travel on a toll road then you have to pay the tolls also. Bangkok taxis are relatively cheap compared to other countries, but don't try to negotiate a fixed price, as you will always end up paying more than using the meter. Taxi drivers often try this one on with tourists, who look like they are unfamiliar with Bangkok and see and get away with it. When you do get in the taxi, just check he puts the meter on. You can gently remind the driver if needed. 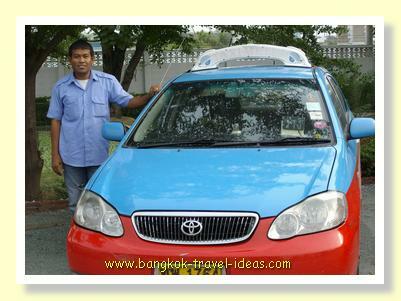 You can read more about taking a taxi from Suvarnabhumi Airport. What better way of getting around Bangkok than by hopping in a Tuk-tuk? Well, for certain areas of Bangkok they are very handy to get around in because they can weave in and out of the traffic and take routes that are too small for cars. You will mainly find Tuk-tuks around the Grand Palace, China Town, Pratunam and parts of Sukhumvit where there are lots of tourists. The price in a Tuk-tuk is entirely negotiable, so you will need to put your best bargaining hat on. For sure you will pay more than a taxi will charge you, but then most tourists like to have a ride in a Tuk-tuk as a reminder of their trip to Bangkok. 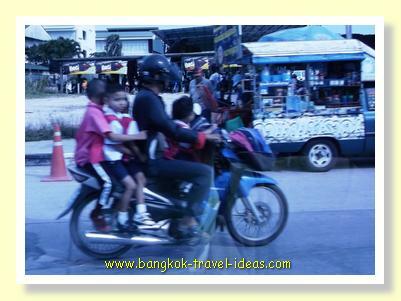 I can see the attraction, but Bangkok Tuk-tuks have a few disadvantages also. They have a low roof-line that makes it difficult to see where you are going, they are quite noisy and you are exposed to the heat and rain. 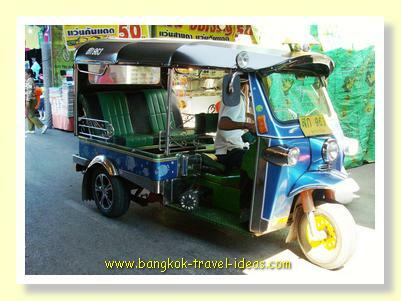 Tuk-tuks are well known for offering a really low price if you let them take you to a Gem Store or Tailor's shop. 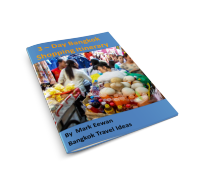 Having said all that; they are synonymous with Thailand and are a great experience and so everyone should use them at least once when visiting Bangkok. In the outskirts of Bangkok, near condominiums and shopping centres you will find the motorcycle taxi rank. These motorcycles will take you several hundred metres to save you the walk to the front of your apartment or condominium or they can be used to weave through the traffic jams on the main roads in Bangkok. 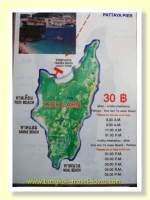 They are more frequently used by Thais and the prices are often printed up on a board, so you don't have to bargain. 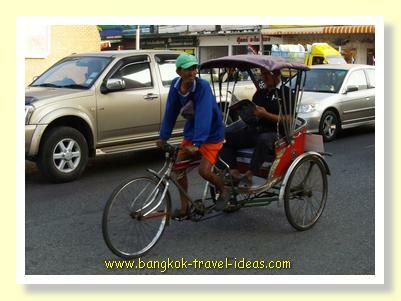 Dangerous, scary and thrilling are all adjectives that come to mind when thinking about Motorcycle taxis in Bangkok, but then again they are cheap, quick and convenient. Most tourists won't ever experience going around Bangkok on a Motorcycle Taxi, but if you ever need to get from A to B quickly when there is heavy traffic, then this is the way to do it, but always remember to wear the crash helmet. Many people like to visit the Grand Palace or the most famous temples of Wat Pho or Wat Arun or even explore the streets of Chinatown. 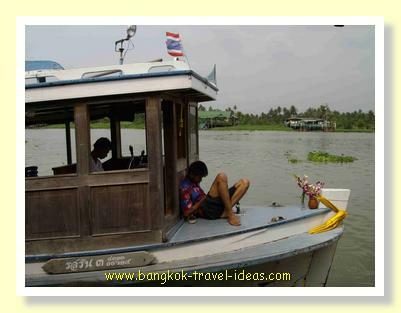 Travelling to this area is easily accomplished by taking a BTS train to Saphan Taksin station and then hopping onto one of the many river ferries. 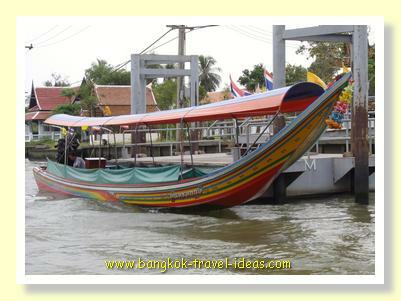 You have the choice of taking the Chaophrya Express, that is more designed for the use of tourists or using one of the local water taxis that the local Thai folk would typically use. 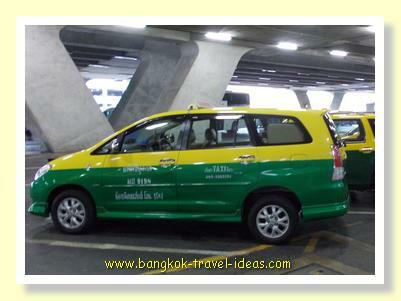 So whether you are a tourist visiting Bangkok or just simply passing through, there is always a quick and convenient way for getting around Bangkok. The days of being able to take a Sarmlor around Bangkok are pretty much gone. If you want to use one of these modes of transport just for the experience then you can look out for them in Korat, Hua Hin and the country towns.